Swami Vivekananda was a Hindu monk who lived between 1863 and 1902. 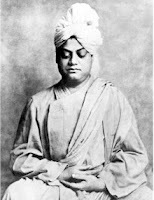 He was a chief disciple of the 19th-century Indian mystic Ramakrishna. You can Google him for quite a few interesting and inspirational quotes, but this is my favorite. For years after reading this, I wanted to find that Universal Religion. from the lowest to the highest man. to realize its own true, divine nature.